Considering purchasing the American DJ F4 PAR BAG (Flat Par Bag 4)? Have questions? Ask people who've recently bought one. Do you own the American DJ F4 PAR BAG (Flat Par Bag 4)? Why not write a review based on your experience with it. I love this product so much I got another one. It may struggle to hold 4 of my lights, but it hold 3 and the cables. Nice bag. I brought a second one. Like the product and the price. Service was great as always. I have a number of these bags that i use for various light fixtures. Primarily designed to carry Flat Pars the bag comes with 3 dividing panels allowing for safe and convenient storage of four Flat Pars - I use mine to carry American DJ Mega TriPar Profile Plus units - these fit perfectly. The internal dividers attach using velcro allowing the option of 4 slim compartments, 2 relatively square compartments or a single rectangular compartment. I also use these bags to store two ADJ Inno Pocket Scans (or Rolls) or two Inno Pocket Spots. The padding is adequate and gives a sensible level of protection given the price point. My only issue is with the size of the side pockets. The bag isn't big to start with and once there are fixtures inside the pockets become tight for putting very much in - the smallest of accessories only. That said there is plenty of space in the bag itself so cables could be stored in the bag. Overall very useful, well made, versatile and a good price. Gets 5 stars from me. Recommended. This bag impressed me a lot. I wanted expecting it to be as well made or as protective as it is. Cheap alternative to a flight case. Great bag so had to by another. Great bag to keep all your Par lights together , you have plenty of room for power cables and other cables such as DMX . Excellent quality I have several some are used for flat pars and one I use for cables for small gigs. Do you have any portable lights? Then this is the bag for you! 'STOP! In the name of love!' Good! I have your attention. I have recently purchased two ADJ Into Pocket Pro moving heads and this protects them perfectly! Nice thick padding for the protection, soft padded individual protectors for inside the bag, to stop the units bouncing off each other and big enough pockets for extra storage! it's a great quality product right down to the zips and stitching! I find that I can also use this bag for my Slim Par 64's, so very versatile. Over all, this product is a 10/10 and all for the low cost price of £23! Bargain! If you miss it! You'll miss out! Bought some of these for my ADJ Inno Pocket Spots and the ADJ flat pars. Perfect for 2 pocket spots or 4 pars. These Accucase bags are superb, great quality and good inner padding too. I can fit 4 ADJ pars neatly into this, though the cabling will need to be transported separately. Great vale too. Perfect for two inno pocket spots. Hold far more than it first looks. Velcro dividers give it flexibility of purpose. Very nice bag used to protect dj lights or cable. Light-weight protection that does the trick. perfect for storing slim pars in. Brilliant little bag to hold 4 adj mega tri pars and cables! Pockets on the sides still make room to spare. Sturdy strong construction holds 4 ADJ Tripars, 1 ADJ 3C IR Mixer, 4 Power Cables, 4 1M DMX Leads and still room to spare. Great little bag to keep all your uplighting together. This bag is perfect for carrying the adj mega tripar profile plus lights with side pockets for cables. PAR's fit perfectly in the bag and a good price. Outstanding bags for £20 in my opinion. i have bought 3 of these, one stores 4 ADJ Mega tripar profile plus par cans comfortably, one i have for my speaker cables (2 x 5m IEC, 2 x 5m XLR) and 2 x 10m extension leads, the other one has about 8 fixtures worth of XLR and IEC extension cables. So they can easily replace my big plastic boxes that i use, and are padded well so i'm confident all my equipment is protected. The handles are comfortable when carrying them and seem strong enough to hold whatever you can fit in these bags. the zips seem relatively strong. i've had these bags for a couple months now and none of the zips are catching or seem close to breaking. there is a small pocket on one side which can probably fit your fixture remotes, a couple safety chains and a couple small cables, although nothing more than that really, definitely not enough to put cables for 4 par cans anyway. in the main compartment there are 3 seperators which make 4 small sections and any of these seperators can be removed or reattached to make more space, so a versatile solution. I have found i can stack all 3 on top of each other without them tipping so a lot easier to stack than they look! so a great, sturdy bag and i will be purchasing more in the future for whatever reason i can, that's how much i like them! Really good case for the money, fits for par cans with half couplers on perfectly. You really feel like your gear is protected with this bag and you know you can put it in the back of a van etc. and it will be fine the other side. Much cheaper than a flightcase as well. Fit perfectly with plenty of space for dmx cables and wires. Perfect Size to hold a single UV COB Cannon and leads. Would definitely purchase again. Good buy and very good quality bargain. sadly won't quite hold 4 slimline lamps ones as stated other than that it's a decent bag. Lightweight nylon bag, easy to carry 4 slim par cans with pockets to stick plenty of spare DMX leads and mains wires. Recommended by DJKIT. However it will only fir "flat" pars not American Pars. Ideal for transporting up to four slimline LED pars complete with yoke. Being fabric with internal padded sections it provides reasonable protection for the fixtures when in the back of the van/car. I currently use it for just two fixtures plus their mains leads in the centre compartment and a 6m DMX lead in the side pocket. I think it would be a tight squeeze to hold four fixtures in the individual sections plus all associated leads so best to keep the mains and DMX leads separate if you carry four fixtures. I've been using three of these for a while now and they stand up well to life as a gigging bag. I have one for 4x ADJ Mega Tripar Profile Plus, one for 2x Inno Pocket Spots and one for 2x Mini Dekker and they're a perfect fit for those fixtures. You can usually fit short mains cables inside the main body of the bag plus DMX cables and/or WiFly tranceivers in the side pockets. They're well padded, durable and very smart. They're obviously not as tough as flight cases but they're a fraction of the cost but worth every penny. Definitely recommended. Love them so much i bought 3 !!!! Great quality bag which stores my 4 mega tri par profile plus lights perfectly. Even space to store a few DMX leads & power cables. I have one of these bags currently to store my 2 ADJ Mega Tripar Profiles and they are very very good value. I have always been a fan of solid flight cases but at the price these bags are I thought I'd give it a go and I feel more than happy with my lights being secure and not damaged through transportation and storage. I am planning to buy some more LED's so willd defiantly be purchasing a few more of these bags. Does exactly what it says on the tin! Fits four par lights perfectly snugly, room for a couple of 3m DMX cables in each side pocket (couldn't fit plugs or DMX cables that were too much longer) and compacts to a small, flat bag (when pars are in use) if needed. Couldn't buy better for the price, in my opinion. Nice bag with enough padding for my needs. Not much room for cables though. Seen a video for American DJ F4 PAR BAG (Flat Par Bag 4) online or have you own video? 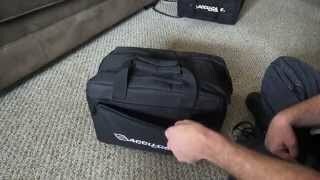 What's in my Accu-Case F4 Par Bags? Check out American DJ F4 PAR BAG (Flat Par Bag 4) on DJkit.com!